Spain's Miguel Angel Jimenez shot a nine-under par 63 to earn a one-shot lead after the first round of the Turkish Airlines Open in Antalya. The 50-year-old made an eagle at the opening hole before adding seven birdies to head England's Ian Poulter, who shot a round of 64. 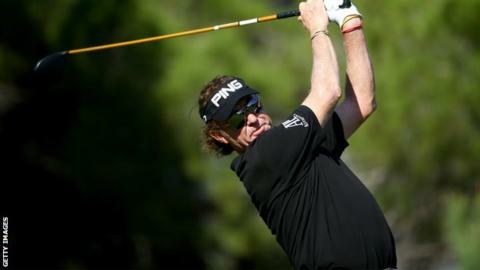 "It's nice making a low score, it's been a while," said Jimenez. England's Tyrrell Hatton, Zimbabwe's Brendon de Jonge and Australian Wade Ormsby are all one shot behind Poulter. The Turkish Airlines Open is the third event of the European Tour's Race to Dubai Final Series - four tournaments culminating with the World Tour Championship in Dubai from 20 to 23 November. Northern Ireland's Rory McIlroy leads the way at the top of the money list, with Spain's Sergio Garcia, Welshman Jamie Donaldson and Germany's Marcel Siem the only players who can usurp him. Garcia's hopes took a blow when he carded an opening 75 at Montgomerie Maxx Royal to lie 12 shots adrift of Jimenez, while Donaldson and Siem shot 72 and 70 respectively. Jimenez's place at the top of the leaderboard is a return to form after the Spaniard carded a final round of 88 in the first event of the Final Series, the BMW Masters, in Shanghai. He also struggled at the second event - the WGC-HSBC Champions event in Shanghai - for a total of 33 over par for his previous eight rounds of golf. "It's special because I've been struggling a little bit and when you shoot under par, you feel good," added Jimenez, the oldest winner in European Tour history. Poulter, who has reverted to an old putter in Turkey as he looks to boost his world ranking of 44, made an eagle, seven birdies and a bogey. "I'm right there," he said. "Within the space of a couple of weeks, I feel really good about myself. I don't have any aches or pains, which is really nice." Scotland's Colin Montgomerie, playing his 600th European Tour event on the course he designed, shot a 76.